2416 Aircraft Control & Warning Unit (Reserve) was formed in Ottawa on 15 July 1950 and was directly accountable to Air Defence Group, later Air Defence Command, through the RCAF Reserve Group at Montreal. The Squadron was initially formed in termporary offices at Beaver Barracks on Metcalfe Street. In 1951, a more permanent home was found at 7 Deleware Avenue, a house expropriated by the DND from the Gleason family. The large stucco and red-tile brick house contained the unit's offices, mess halls and classrooms. 2416 also used facilities at RCAF Station Uplands. Like the other AC&W units within the Auxiliary Force, 2416 AC&WU was equipped with the AMES-11C radar and associated equipment. The radar and equipment were mounted on trucks so that they could be easily transported to various locations when and if they were needed. 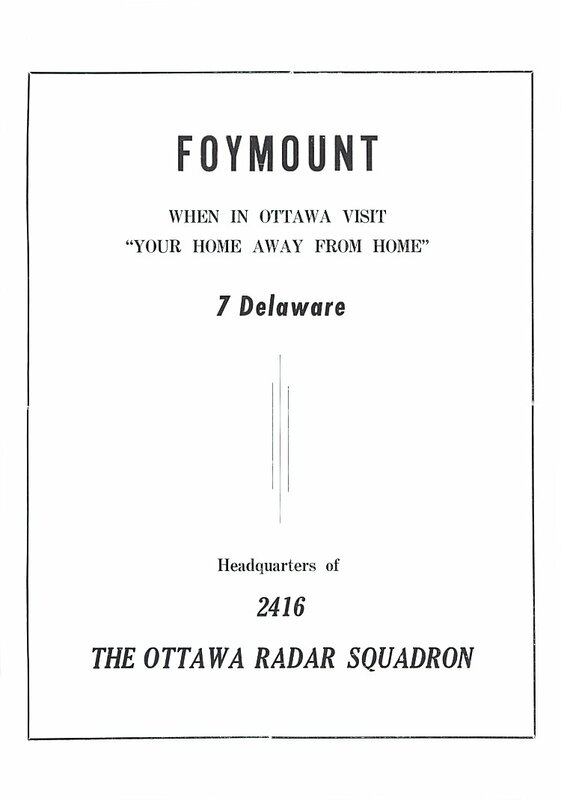 Most of its work dealt with training radar and fighter control operators either on its mobile AMES-11 or at week-end and summer exercises at RCAF Station Foymount. The unit became Auxiliary on 1 November 1951 and on 1 December 1953, attained Squadron status. 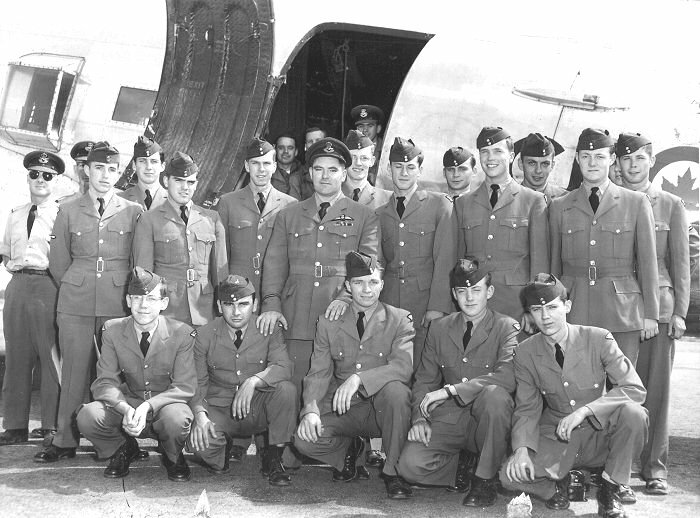 On 1 March 1957, the Squadron ceased reporting to Montreal and now were responsible to the Auxiliary Group in Toronto. As the majority of Auxiliary flying squadrons converted to the emergency and rescue role and were assigned to Air Transport Command, it was decided that the Auxiliary AC&W Squadrons would report directly to Air Defence Command starting 1 October 1958 as this was their raison d’etre. The unit was initially located in a building in downtown Ottawa but in the summer of 1958, the Squadron moved to RCAF Station Uplands. Narrative reports on the Pinetree Line web site confirm that 2416 AC&W Squadron was active at RCAF Station Sydney in 1955 and at RCAF Station Foymount, ON during the years 1954 to 1958 inclusive. 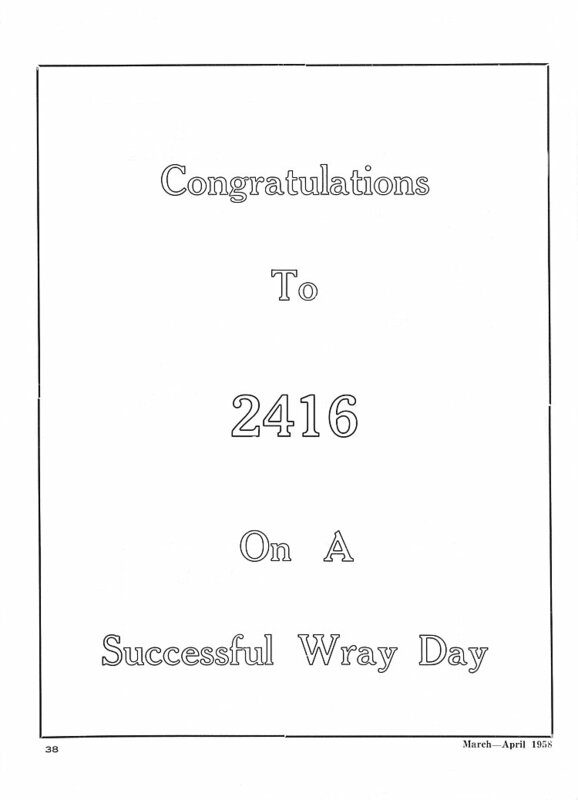 2416 AC&W Squadron was disbanded on 31 December 1961 as their manual operations were no longer required to assist the Regular AC&W Squadrons as the SAGE system was coming on line. The old Gleason home was sold off and eventually became the Hungarian Embassy. Organization Order R2.0.7 - 12 June 1961. Historical Narrative - 1 December 1960 to 31 May 1961. Historical Narrative - 1 June 1960 to 30 November 1960. Historical Narrative - 1 January 1960 to 31 May 1960. 2416 AC&W Squadron personnel during their summer training at Foymount - June 1959. Historical Narrative - 1 January 1959 to 31 December 1959. Historical Narrative - 1 June 1958 to 31 December 1958. Organization Order R2.0.0.8 - 1 June 1958. 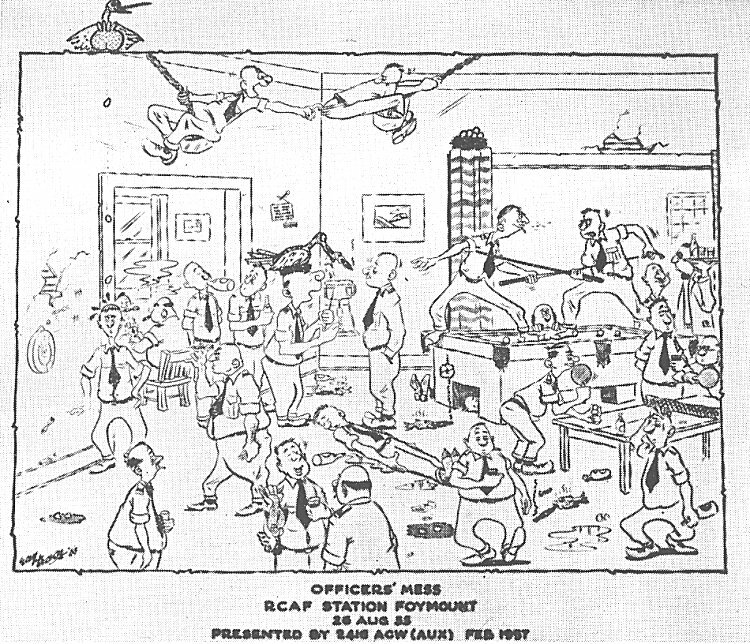 Officer's Mess cartoon - March-April 1958. 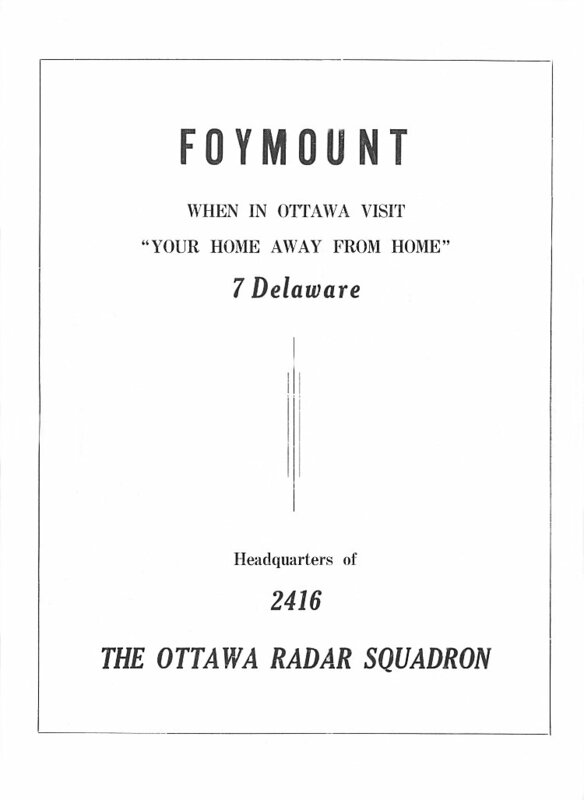 Extracted from RCAF Station Foymount "The Breeze" magazine. 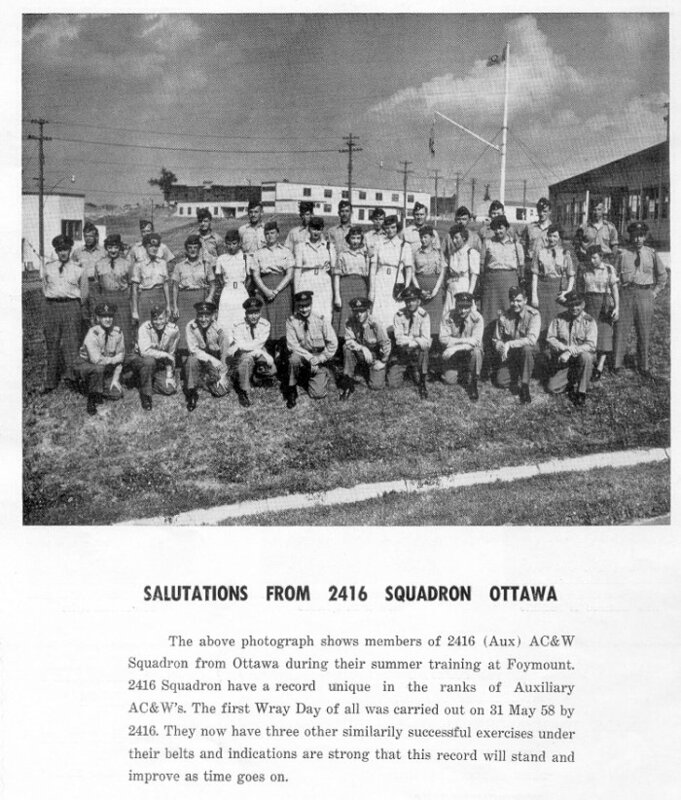 Congratulations to 2416 AC&W Squadron - March-April 1958. Your Home Away From Home - March-April 1958. Your Home Away From Home - January-February 1958. 2416 and 2451 AC&W Squadron volunteers assist in an air search for a missing aircraft. Taken in Val d'Or, Quebec - July 1957. Warman Barnard (2416 AC&W) rear row 2nd from right, Ren L'Ecuyer (2451 AC&W) front row 1st left. Historical Narrative - 1 June 1957 to 30 November 1957. Historical Narrative - 1 June 1956 to 30 November 1956. Historical Narrative - 1 January 1956 to 31 May 1956. Historical Narrative - 1 July 1955 to 31 December 1955. Organization Order R2.1.11.4 - 28 December 1954. Historical Narrative - 1 December 1954 to 30 June 1955. Historical Narrative - 1 July 1954 to 30 November 1954. Historical Narrative - 1 December 1953 to 30 June 1954. Organization Order 85/53 - 23 November 1953. Historical Narrative - 1 June 1953 to 30 November 1953. Historical Narrative - 1 June 1951 to 31 December 1952. Organization Order 56/51 - 25 May 1951. Historical Narrative - 7 November 1950 to 31 May 1951. Organization Order 21/50 - 6 July 1950.